When architects Anne Van Ingen and Wes Haynes set out to aid the New Orleans recovery effort by restoring a home in the Ninth Ward for low income buyers, they thought their work would be welcomed. But bureaucratic interference and misguided policies have turned a good deed into a nightmare, writes Roberta Brandes Gratz. If you want a window into how truly dysfunctional the government of New Orleans is under Mayor Ray Nagin and how the city is recovering despite itself, follow the restoration saga of Anne Van Ingen and Wes Haynes. Van Ingen and Haynes are New York architects and preservation specialists who wanted to do something to help the recovery. They are doing just that, big time in a small way. In January last year, they attended a National Trust for Historic Preservation meeting in New Orleans where the Trust instituted a major effort to support the city's rebuilding by helping low-income homeowners restore their homes. Inspired, Van Ingen and Haynes bought a Katrina-damaged 1000 square foot shotgun house in Holy Cross, the historic district section of the Lower 9th Ward. They are restoring this typical shotgun themselves -- originally a traditional Caribbean housing type -- with scores of volunteers, who are going to New Orleans at their own expense from the Northeast. When finished, they will resell this classic 1915 historic house to a local low-income resident only at their cost, no profit. One can't contribute to the recovery better than that. 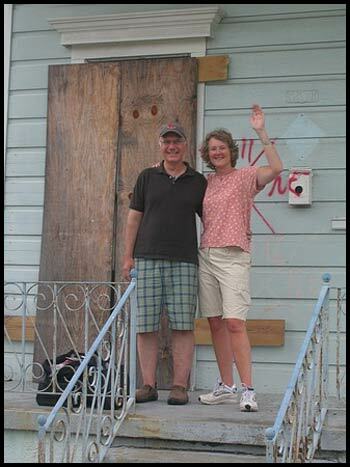 Wes Haynes and Anne Van Ingen in front of the shotgun-style home in New Orleans' Ninth Ward that they are working to restore, before things turned ugly. But five months after purchase and in the middle of restoration work, the city informed them that their little authentic house is scheduled to be expropriated for demolition by the city as a blighted property! This despite the fact that official records show the house was sold. Official records also show that Van Ingen and Haynes have all their building permits. And official records show that the Historic Districts Commission approved their plans. The title search, too, gave no indication of this status. New Orleans native Kevin Mercadel of the National Trust has provided invaluable help maneuvering this arduous and often Byzantine process, the kind of help being provided property owners around the city by scores of community-based assistance groups. Mercadel was perplexed too by this turn of events. Nowhere in the process did an alert come through to this pre-demolition status. Only serendipitously, a staff member of the New Orleans Recovery Authority (NORA) called to inform them of the condemnation proceeding. He saw the change in ownership and knew Van Ingen's and Haynes' lawyer. He made a courtesy call. The momentum of bureaucracies, not an unfamiliar condition in every city, is often unstoppable. But, could it be that the city gets only demolition money from FEMA, not for repairs, and also uses CDBG money to tear down but not rebuild houses? The state, too, pays for demolition only. HUD provides Road Home money for the city to pay contractors and non-profit organizations to repair affordable housing units. Recently it was revealed that the city has failed to even spend the millions -- somewhere between $11 and $35 million -- given it by HUD, although non-profit organizations have done work and not yet been reimbursed. There has been no money for repairs except for small select programs of private and philanthropic groups. On all levels of government demolition is easier to come by than renovation. The only repair money is the federal Road Home Program and a very small state historic preservation grant program with onerous strings attached. One eligible grantee elevated his house and was disqualified. Worse, some of the grant money went to homes that are now scheduled to be demolished for the tragically-sited new Charity hospital. The term Catch 22 was invented for post-Katrina New Orleans. Evidence is observable in cities across the country, however, that urban regeneration only comes with the reclamation and restoration of old neighborhoods, not through demolition and landbanking. Just recently a house needing repair in another neighborhood was demolished, even though it had been bought last May by a couple planning to return and renovate. They were never informed. The city does not even allow the rescue and salvage of historic architectural elements of the demolished houses. Following the Holy Cross block that Van Ingen and Haynes are working on reveals the good news but also more bad. When they closed on this house in August, one other house on this 10-dwelling block was occupied, that of Dolores Wells, a friendly but watchful grandmother who lives alone two doors down. Wells was thrilled when these two outsiders came. "I wanted them to live here," she says with a laugh. She couldn't have been more welcoming and helpful, even letting them plug into her electricity before they got theirs – a generous favor in a city where energy rates are quite high. She, too, had been helped by volunteers who came from afar to paint her house after a paid contractor repaired it. She had run out of funds to complete it. Wells is no longer the only occupant on the street. All 10 houses are now occupied or in some stage of repair since August. This pattern is occurring all over the city. If one resident returns on a block, others follow. Owners weren't even allowed back for months after Katrina. That delay caused as much damage as the storm in many cases because without opening windows, a house can succumb to mold. Now the additional bad news. The little shotgun between Wells' home and Van Ingen's and Haynes' was also put on the blight list -- unbeknownst to the owners -- and scheduled to be expropriated. But it, too, has been totally restored and the elderly owner moved back in just after New Year's Day. In fact, this house was redone at no charge by two local contractors, friends or relatives of the owner. The extraordinary amount of volunteer work happening all over this city is not being done by outsiders alone. Many locals help each other out. Contractors gave free help to another woman on the block who was a victim of contractor fraud, paying for work that never happened. Not an unfamiliar story. Whether outsiders or locals, this is how the rebuilding is occurring and, as this story shows, in spite of every level of government. And only the resistance of committed citizen activists is preventing even worse scenarios. Enter Karen Gadbois, an extraordinary example of the many local citizen activists without whom New Orleans would be in even worse shape. Through her website, Squandered Heritage (URL), Gadbois has been uncovering official plans to expropriate and demolish homes of unknowing people who are either planning to rebuild or in the process of doing so. She has found homes demolished by the city that were never flooded nor badly damaged. And she has found clean up work the city claimed was done and paid for with public funds that didn't happen. Gadbois was not surprised by this current saga, nor were others. "No one believes me," she exclaimed. "People think something like this comes out of the blue, an abstraction in my own head, but it happens all the time." Among citizens, this seems to be well known. "It's amazing," noted Van Ingen. "No one I tell this story to is surprised." Through her website, Gadbois has been drawing attention to the inaccessibility of critical property information. This lack of inter-agency communication and overall lack of transparency government-wide not only impedes the return of many displaced New Orleanians but, she says, reflects "a callous, capricious and insidious attitude on the part of the city administration. They say they want people back, but exhibit a wanton indifference to property owners, investors and the architecture of the city." Then Gadbois started scrutinizing city lists and found more than just "predatory demolition." She found enough numerous false records: houses classified as blighted and demolished that had been restored, false reports of publicly-funded work done, contractors paid for clean-out work actually performed free by volunteers. This, she felt, was too big for just her website. She informed a local TV station that aired the story. Mayor Nagin accused Gadbois of hurting the recovery. An investigation is underway by the U.S. Attorney for the Eastern District. Without question or challenge, the city grants owner requests to tear down their house. FEMA pays the bill. "Well-placed contractors get the demolition jobs," Gadbois notes. "You don't need to know how to do anything. Just get a backhoe and a hose and show up." This startling circumstance was revealed to Van Ingen and Haynes when they first went to the Department of Safety and Permits. If a house is listed at more than fifty percent damaged, it automatically qualifies for demolition. Many property owners have asked for their evaluation to be raised to qualify for demolition. So when Van Ingen and Haynes showed up, Van Ingen recalls, "they assumed we wanted it torn down. No. No, we said. We want it lowered to qualify for rebuilding." Additional conditions fuel Gadbois' outrage. Code enforcement. "They are citing people for paint peeling and missing clapboard violations," she says. "It is so premature for that kind of detail," she adds, "especially when some of them are waiting to match the historic paint color or have run out of money before completing the renovation. And the city is actively giving violations for exterior building and front yard conditions when work is going on inside first." "Exterior conditions should come first," noted one official. "The primary obligation is to the community, to be a good neighbor." As noted, the term Catch 22 was invented for New Orleans. Roberta Brandes Gratz is an urban critic and author of The Living City: Thinking Small in a Big Way and Cities Back From the Edge.